Standard is getting dark. Dark like Silent Hill. Dark like Batman Beyond: Return of the Joker. Dark like Torment, or Apocalypse, or Zendikar. Wait, Zendikar is still in Standard . . . well, anyway, I wouldn't recommend playing this card on a rainy night with the lights low. I would, however, recommend playing this card if you have a deck based around the proliferate mechanic, and you need extra cards to get the counter-adding insanity started. Later in the game, this card can also sometimes boil down to "2B: Kill everything, then win the game," which generally tends to get people's attention. 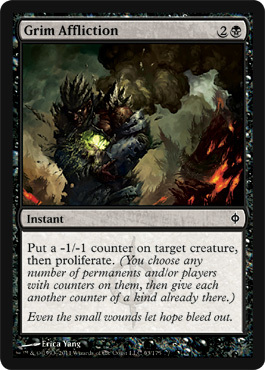 Today's card of the day is Grim Affliction which is a three mana instant that puts a -1/-1 counter on a target creature then allows you to Proliferate. As it effectively works as a -2/-2 to a target and additional counters to either anything you've hit with Infect, Wither, or your own +1/+1 counters, loyalty, and charge counters this can be a very efficient card in the right deck. The casting cost is a bit high for Black removal, but used correctly it should work more as Proliferation with removal as a bonus. Overall a good addition to the color and something flexible, but really needs the right deck to shine and can't just be added to existing builds to get the full potential. In Limited any removal is good and attaching it to Proliferate in a format where both it and Infect are strong makes it a very solid common. Well worth drafting in multiples and early in the pack during Booster and a copy or two in Sealed should help direct you towards using Black in your deck. The single Black in the casting cost allows it to be splashed if necessary for the option of either aspect and with the right support it can make even a relatively weak pool a bigger threat. Welcome to Card of the Day here at Pojo.com. Today we take a special look at a card coming out in New Phyrexia, Grim Affliction! Grim Affliction is an instant that costs two generic and one black mana. Grim Affliction puts a -1/-1 counter on target creature and then lets you proliferate. Grim Affliction is definitely going to be potent. The ability to put another -1/-1 counter on the target, as well as additional counters to other permanents with counters due to the proliferate means that for three mana at an instant speed, a lot can happen. When used with cards such as Black Sun’s Zenith, this could be a board wiper. Sure to be one of the better commons in the set. Stay tuned for more preview cards from the new set, New Phyrexia. And be sure to attend your local prerelease next weekend, May 7th, to get your hands on the new cards, and a special alternate art foil Sheoldred, Whispering One!